Old Mr. Petrovski was in a hurry. He had medicine in his pocket for his wife, He’d just been to the drugstore, and had visited too long there with the druggist who had taken care of him and his family for over 40 years. Now, he needed to get back to the apartment and make sure Zofia got the medication that would ease her headache and allow her to sleep. Looking carefully, Mr. Petrovski saw that the light had changed. Still, he was cautious. His eyes weren’t as sharp as they’d been when he was young. But there were no vehicles moving against the light, so he placed his cane carefully over the curb, making sure it was stable on the pavement of the street before he stepped off and made his way across. “Such a bother, such a trouble,” he muttered to himself as he hurried as fast as his lame knees and failing vision would allow. He thought with longing of the days when he would fly home to his Zofia, feeling as light as a bird. Ah, those were good days. But these were good days, too, and he still had his precious Zofia to look after and to care for him. Some people did see him fall. Three young women carrying go-cups from the coffee shop came running across the street, bending over Mr. P to see what kind of damage there had been. Natalie hurried to put her cup down near the traffic light, then joined her companions at the old man’s side. “Come on, you two, we have to turn him over and see if he’s conscious,” ordered Nat. “Wait, shouldn’t we make sure he didn’t hurt his neck or something? I mean, maybe it’s not safe to move him,” replied Tammy. “Yes, you’re right. Let’s check his pulse, and maybe if he’s awake we can get him to talk.” Natalie put her fingers on Mr. P’s neck, immediately finding a good strong pulse. Groaning, Mr. P started to try to turn over. With a laugh of relief, the three young women worked to help Mr. P get to a sitting position. While they worked, a man on a small motorcylce climbed the curb, turned off his bike, and rushed over to the group around Mr. Petrovski. Natalie’s first reaction, when she saw the cyclist jump the curb, was intense distrust. He was dressed all in black leathers, from his boots to the jacket that was zipped to his chin. His hands were protected in thick black gloves. He still wore his helmet and dark glasses, so very little of his face was visible. The cyclist, however, showed no signs of wanting to do anything but help. He knelt on the sidewalk behind Mr. P, who had managed to roll over on his back. Carefully, the biker put his hand under Mr. P’s arms and around his chest, hoisting him up against the black leather jacket. While the biker was getting ready to help Mr. P stand up, Natalie got a good look at the old man’s face for the first time. “Mac,” said the biker. He grinned, looking into Natalie’s pretty brown eyes. He liked brown eyes. A lot. Natalie, a very pretty name, matched her very pretty face, he thought, He like her smile, liked the compassion he saw in her eyes, liked her wavy dark hair that spilled over her forehead and around her face and neck. Liked the way she obviously cared about the old guy he was holding. Actually, he liked this whole situation. “Sure, I guess so,” replied Nat. She took Mr. P’s hand, squeezed it, and asked him if he were ready to get up. “Yes, yes, yes! I could have been up by now if you weren’t all hovering like a bunch of mother hens! Let’s get on with it,” he answered, but with a twinkle in his eye. And Mr. P was back up on his feet. He wobbled for just a moment, then regained his balance. “Did any of you see where my glasses went? And my cane? I sure hope my glasses aren’t broken!” Then, remembering Zofia’s medication, he felt his pocket to see if the plastic bottle was intact. With relief, he found everything in one piece. “It’s okay, Nat, we’ll tell the boss what happened. He’ll be fine, and you’ll get there when you can make sure everything’s ok with your friend here.” Tammy and Jodi turned to go back the way they had come. Natalie stood there feeling stunned, looking at the biker’s dark glasses but not seeing anything that reassured her. Then, Mac did a very gentle thing. After helping Mr. P get his bent-not-broken glasses back on and handing him his cane, Mac took Natalie’s hand and placed it in the crook of Mr. P’s elbow, giving her hand a little squeeze. Shaking her head at how neatly Mac had maneuvered her into doing what he said, Natalie glanced up at Mr. P’s face. He was smiling broadly, seeming to enjoy some private joke. Thirteen is a wonderful, terrible age. Still caught somewhere between childhood and womanhood, the thirteen-year-old girl has hopes and wishes and dreams that she doesn’t truly understand. Things are happening in and to her body that are both exciting and confusing. Emotions she doesn’t understand can overwhelm her with sadness or delight. She’s at odds with herself, with her family, with everything as it is; at the same time, she needs desperately to have the comfort of her family and the safety of home while she dreams about all the things on the outside of that comfort zone. So, as Gina stood at the fountain that shimmered with wish coins, she gripped her own while she thought of all the things she could wish for. Her dreams tended to reach far into the future. She saw herself as a prolific writer of great historical novels. She pictured a mansion filled with beautiful furnshings and echoing with the laughter of children. She heard the resonant voice of the world’s most incredbly handsome man as he called for her when he came in from his business day. Leaning over the edge of the fountain, she saw herself. Long hair, straight and mud-brown. Bad skin. Big brown eyes, her best feature, didn’t make up for her lop-sided ears and the gap between her two front teeth. Gina didn’t believe in fairy tale magic. There would be no Prince Charming in her future, she was sure. She wasn’t about to waste wishes on things that were impossible. Lost in thought, she didn’t notice the little old woman who approached the fountain and stood next to her until she felt a hand on her shoulder. Glancing up, she smiled a bit at the kindness she saw in the woman’s eyes. “Did you ever make a wish here?” she asked. The woman turned and walked away, and Gina still sat on the edge of the fountain, dreaming. 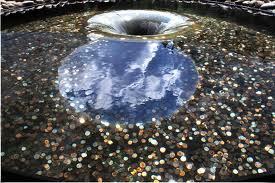 Finally, she stood and tossed her coins, one by one, into the clear water. I have in front of me my dad’s typed story of the Utah blizzard I mentioned earlier this week. I also have my own version, in which I did my best to keep my dad’s voice while smoothing out some details. It’s a good day for this. We got some more snow overnight. It’s beautiful, really, and put me in the mood for this story. It was mid-December, 1931, in the part of the desert known as the Arizona Strip. The color was grey–sky, ground, clouds, everything. Even the pick-up truck that stopped where the track turned off was grey. Grey, rusty, and low on fuel. “We’ll run dry if I take you all the way to your place, kids. Sorry, but I still have five miles to go and no spare gas. You only have a couple miles to walk. You’ll be fine.” But as he spoke, Mr. Higgins glanced up through the dirty windshield and flared his nostrils as if he could smell the air. As John and Lucy stood waving, the rattly old truck belched off down the track, squirting great puffs of smelly grey smoke. There was nothing else anywhere; just grey earth and grey sky, and a few grey bushes here and there. Lucy looked up at her big brother with total confidence. Johnny knew the way home. He knew the desert. He spent all his spare time outdoors, and often bragged to Lucy that he just couldn’t get lost. John took Lucy’s mittened hand and started off down the track toward home. “Mama said we could put up her Christmas decorations tonight, too, Lucy. All the pretty ones from New York. So let’s hurry. You’ll have to walk fast.” John glanced down at his little sister, so proud to be a first-grader, and felt very protective and superior in his ten-year-old wisdom. “You’re a young man now, John,” his dad often told him. “You can take care of yourself. You can take care of your sisters and your brother. We depend on you!” Warmed by the thought of how much his folks trusted him, John pulled Lucy along at a trot and headed for home. Home was a dugout built into the side of a low rise in the desert. Mom’s old cookstove made it a wonderfully cozy place in the cold that settled down over the desert on a winter night, and John looked forward to taking his boots off and warming his toes. John stuffed Lucy’s little hand into the pocket of his sheepskin coat and buttoned himself up, pulling down the flaps of his hat and wrapping the scarf around his nose and mouth. The scarf was wool, and scratched at his cheeks and chin. But it was warm. As the two children tramped toward home, the wind picked up speed and began to swirl and buffet from every direction. The sky was greyed out with evil-looking clouds that rolled and spread, seeming to stretch down fingers of ice that reached beneath the collars of tightly-buttoned jackets. Then suddenly, without warning, the clouds began to dump snow as if they were down-filled pillows that someone had sliced with a knife. The “feathers,” however, weren’t soft and tickly. The icy flakes bit into their eyeleds and cheeks, gathering thickly in clumps on eyelashes and brows. The sky darkened steadily, and what had been familiar territory just a few moments before was now an infinity of grey meeting grey. John was scared. “Johnny? How much farther?” Lucy’s voice was high and squeeky, but she tried bravely not to let John know how terrified she was. John kept his eyes on the ground, hoping to recognize bumps and stone piles that he knew were there. Shortly, he knew that he had begun to do the one thing his dad had taught him to watch for–he was walking in a circular pattern. As Dad watched the boiling clouds and felt the first stinging bite of snow against his face, he made up his mind. Dad buttoned up his coat, drew on his gloves and hat, and faced into the wind. Bent at the waist, he arrowed his way to the shed that sheltered his small herd of sheep. In his left hand, he carried an old railroad lantern that was built to keep burning to matter how much the wind blew. Once inside the shed, Dad hung the lantern from a hook in one wall. He pulled two poles down from their bed across the rafters, and, using baling twind, he lashed them together tightly. He pounded a small spike into one end of the pole. Carrying the pole and a pick outdoors, he went to the only high ground nearby and quickly dug a hole, using the pick effortlessly to break the hard but unfrozen ground. Sweating in spite of the cold and snow, Dad lifted the lashed pole high and dropped it into the hole. Working quickly, he pushed sod back into the hole around the pole, packing it tightly. Stretching his full height and reaching his arm to the limit, he was able to hang the lantern on the spike. Then, pausing only to reassure himself that the pole would stand, he hurried back to the shed. He grabbed the baling twine and tied it securely to the door. Holding the other end, he began walking in the direction his kids would have to be coming from if they’d stayed on the track. John and Lucy trudged doggedly through the increasing darkness, pushing against the wall of wind and wiping snow from their eyes. As the wind tossed the snow in swirls and spirals all around them, they caught glimpses of shapes they couldn’t recognize. “Aw, probably just a maverick trying to find his way home–like us! Don’t worry.” But John was worried. There were all kinds of things in the desert that could hurt little kids, and he wasn’t sure of his way any more. He was pretty sure they were off the track, and he kept a close watch on the ground and in the distance, looking for something familiar. Finally, he spotted a small wash and a large patch of beavertail cactus that he knew were part of the flats to the south of the dugout–opposite to the direction they should be going. He stood still for a moment, hugging Lucy close and scanning the distance. Blinking, he thought he saw a flash of light like a star behind a wispy cloud. “Come on, Lucy, we’re almost there!” Watching for that elusive glimmer of light, John turned sharply from the wash and headed north. Faintly, John and Lucy heard a voice calling their names. They hollered back as loud as they could, and presently bumped into their dad’s safe,comfortable embrace. They all turned and followed the trail of twine, watching the growing halo of light from the lantern on the pole. Ellen pulled her children through the door, hugging them tightly against her, wet coats and all. John could feel his mom’s tears on his own cheeks as she began to help them pull off hats, scarves, and mittens caked with snow. We lived in southern Minnesota in 1965. That doesn’t seem very long ago to me, but probably seems like another world entirely to some of you. It had been an eventful year. My mom had been miserable for some time with what we quietly referred to as “female troubles.” Since my little brother had been born, things just hadn’t been right for her. Finally, her doctor recommended a hysterctomy. The surgery was done in a hospital about 15 miles away, in Madelia. We lived in St. James. Under normal circumstances, the distance was no big deal. However, this was winter. It had been a very snowy, very cold winter. When we said “white-out” there on the prairie, that’s exactly what we meant. You did NOT want to get caught in one of those out-of-nowhere blizzards that blocked your view just inches from the end of your nose. The snow seemed to come from an endless supply of white-grey clouds. 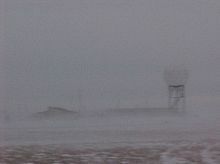 The winds were literally sideways, and it was no fun to have to go out in that mess. My mom’s surgery took place a day or two before this story; my memory is a bit misty after all these years. Dad decided he could make it to Madelia and back before the impending storm got too bad. Mom would be so sad if he didn’t go to see her, and he wanted to make sure she was being properly cared for. So off he went, in his big grey overcoat and rubber, buckled-up overshoes. He hated hats, and never wore them. The house was warm, and I wasn’t worried. I put Johnny down for a nap, put together a big pot of soup so Dad would have something hot and nourishing when he got home, and settled down to read. When Johnny woke up, it was nearly time for supper. It was winter; the days were short, and darkness had alread settled in. I got Johnny up, fed him, played with him. I turned on the television and learned that there were white-out conditions all across the southern part of the state. Still, I wasn’t overly concerned. My dad, after all, knew how to handle himself in the snow. He’d be fine. Maybe he’d even decide to stay overnight at the hospital. Expecting a phone call, Johnny and I settled down with the TV and a warm blanket. He was soon fast asleep, so I put him to bed. And now, the waiting had me worried. Dad had told me he’d be back by suppertime, and it was at least 8:30, maybe later. The wind sounded wicked, whistling around the old farmhouse we lived in. Those older houses weren’t always insulated when they were built, and the fingers of icy wind worked their way into every tiny opening. I shivered, and I waited. . . . I went upstairs, turned on every light there and then went back downstairs and switched on all the lights there, as well. Feeling very frustrated because I couldn’t think of anything else to do, I call the police and told them my dad was out there somewhere between Madelia and St. James. I told them the car model and year, but didn’t know the license plate number. And I waited. Listening to that awful wind, I thought how it must have been for pioneer women in sod huts or log houses. No nearby neighbors, no way to communicate with anyone. Darkness over twelve hours every day. Biting, miserable cold. Windwindwindwind, and snow beating against the house. Meanwhile, back in Madelia, my dad had left the hospital around 4 p.m. Under normal conditions, he would have been home by 4:30. A blizzard of that magnitude, however, was anything but normal. He had to drive very slowly, and most of the time waited for the moment his tires would go off the shoulder into the fields. He couldn’t see, and was driving pretty much by feel. Then, he saw some red taillights. They were high enough that he knew they were on a truck, and he pinned his hopes and a prayer on the likelihood that the truck driver, from a higher vantage point, had better vision. He stayed as close to the truck as he could, and knew from some dim lights that he’d made it to St. James a couple of hours later. Now the really bad stuff started. The highway was on the other side of town from our place, so he had to find his way across town, maybe a mile and a little more. No plows, no visible cars or trucks, and apparently the power was out. He couldn’t see the one set of traffic lights that would tell him he was near the turn to our place. Again driving by feel, he finally did feel his wheels slide off into a ditch. Dad was pretty good with directions. I don’t know if he’d ever been truly lost. But this was different, and he was disoriented because of the storm. So he bundled up the best he could, grabbed a shovel out of the trunk of the now-useless car, and started to dig his way in what he hoped was the direction of some help, if not of home. At one point, he stopped to rest, looked up, and saw some lights burning fairly high off the ground. He made those lights his compass, and began again to dig and walk toward the glow. The wind was truly brutal, and tore the shovel out of his hands. He told me later that he really wondered if that was how he would die–lost in a blizzard, frozen. When he finally made his way to the source of the lights, he still couldn’t see much. He felt his way around the building, found a door, and began to pound and holler. And. . . .you guessed it. . . .I went to the door and found what looked like the Abominable Snowman standing there! He was shocked to see me, because he really didn’t know he was home. I was shocked to see him, because I really thought he’d stay in Madelia! It took him a long time to get warm. There wasn’t much conversation, but I put some hot soup in front of him and eventually he ate it all. He was completely exhausted, grey in the face and looking about as wrung out as I’d ever seen him. We both went to bed with a lot of thanksgiving in our hearts. I got to thinking about my dad’s stories, and this is one I particularly loved. I worked on it several years ago, but have never submitted it anywhere. Afraid of rejection, I guess. I hope you’ll enjoy it. Tip was a mutt. She wasn’t pretty at all. She was dirty white with brown saddles across her skinny back; her face was mottled with brown spots. She had red-brown eyes, small and often bloodshot. Her muzzle was pointy, with white whiskers under her bottom lip. She had a deep chest, and her legs were long and suited for the wild runs across the desert that she loved so much.bShe had a long, narrow tail, brown, except for the white tip. She had three loyalties. The first was to John, who walked with her across the dusty flatlands as they hunted to fill the pot for supper. Usually they managed to scare up a jack-rabbit zigzagging across the brush. Tip always caught up, barking with ridiculous ferocity as she cornered her prey. John would finish off the terrified rabbit with one shot from his rifle, and supper would be on the table within a couple of hours. Tip’s second loyalty was to John’s mother, Ellen. She went to Ellen when John was in school, looking for someone to pull the cactus thorns from her pads or pick the burrs out of her hide. Ellen was the food source when Tip didn’t feel like hunting. She could always be counted on for table scraps, however meager, and she kept Tip’s water bowl full during the long, hot desert days. She was kind. Tip would have killed to protect her. Tip’s third loyalty was to her pup, Duke. Ornery, mean as a snake, unfriendly to all comers, Duke lived under the shadow of Tip’s protection. Because John loved Tip, he tolerated Duke. But John could never break through Duke’s reserve and dislike. The dog refused to be petted, would never learn to hunt or follow obediently and quietly. Many times, he had frightened off rabbits and other small game with his aggressive barking and snarling before John could get close enough for a shot. John was frustrated by the animal, and more than a little scared of him. He was mean, a loner, and a puzzle to the boy whose dog was his closest companion. John lived in a dugout in the Utah desert. The roof was sod, domed over the inside of the dugout just enought that you knew it was there as you approached. Inside, it was cool in summer and warm in winter, but those were about the only luxuries. John’s dad had moved his family there from California shortly after the crash of 1929, bitter at his financial losses. His search for work kept him away from home for days at a time, but John never minded. He loved the desert; for a twelve-year-old boy, it was paradise. He had an old pony, a good dog, a gun, and all the time in the world. “Where you headed, Son?” ask Ellen as John pulled on his boots. Ellen sighed as she watched her oldest son hunch down through the low entrance to the dugout, carrying his rifle and whistling for Tip. He slung a game bag over his shoulder and under one arm, sure he would either find a rabbit in one of his traps or scare one out of the brush. As Ellen watched him go, she thought of all the normal things a boy would be doing in the city of her girlhood. Trapping rabbits for supper would surely not have been one of his activities. John settled into a comfortable, mile-gulping stride across the dry sod. Tip had come running at his whistle and walked beside him, her keen eyes constantly searching for suspicious movement in the brush. Tip glanced up at John as he spoke, looking for all the world as if she understood and wanted to defend her pup. Tip was such a good dog. Loyal, obedient, a good hunter; she could run like the wind, but always came back to the whistle. Not like Duke, who ignored every attempt to train him to usefulness. Sometimes, John was sure, Duke glared at him with hatred and contempt. John had learned to scan the ground around him as well as the near distance as he walked. He was alert to all the sounds and smells of the desert, and loved everything he saw. Long practice had made him comfortable with the isolation, and he actually enjoyed the solitude. It left him free to think, with no interruptions from younger brothers and sisters. It wasn’t long before John and Tip came across the first of several traps he’d set. It was empty, so John checked the ground around for tracks and found nothing to lead him off on a rabbit chase. He had half-a-dozen traps, the spring type that clamped shut on an unwary critter’s leg. John always hoped he would find a trapped animal quickly. He took no pleasure in causing fear and pain. Life was tough on the desert. You had to survive, and John had become the main meat-provider for his family. Tip and John continued to walk, checking the traps as they went and finding them all empty. Some days were like that, and all John could do was hope to find food on the way back home. They had one more trap to check when John’s sharp ears began to pick up a high-pitched whimpering. All his senses on the alert, John spoke sharply to Tip, bringing her to heel. He couldn’t identify the noise. It didn’t sound like any rabbit he’d ever trapped–sounded more like a hurt dog. As that thought crossed his mind, John groaned and kicked angrily at the ground. As John and Tip neared a patch of brush and rock, the whining became more frantic. Tip had run ahead and was barking wildly. She ran back to John, circled him, barked once, and took off again. She was just as frantic as the trapped animal, and John began to run as he came close enough to see that it was for sure Duke, his right foreleg caught just above his paw. He was lying very still, whining piteously. His rib cage heaved with his labored breathing. He was in a lot of pain. John approaced the trap carefully. Duke was a mean dog to begin with, never letting anyone come near him. John wasn’t about to be bitten trying to help this ornery mutt. Duke growled, low and menacing, as John hunkered down to look the situation over. Tip stood over Duke, occasionally licking his caught leg. John gingerly reached out his hand toward the trap, nervous about putting it within reach of Duke’s muzzle. The dog bared his teeth and raised his neck fur, but made no effort to bite. He watched John with unblinking eyes as the boy worked at the release lever, and when the trap popped open, the dog quivered in increased pain. He made no move to get up. John stood, scratching his head. “Now what? Do I try to carry you? You’d probably take my arm off if I tried, you miserable excuse for a dog. Shoot! How do you help someone who’s so blamed mean?” John stooped and tried to scoop his arms under the quivering dog. Sure enough, Duke growled and snapped. As John strode away, hot tears of frustration and remorse choked him and scalded his eyes. Why should he cry for such an ungrateful critter, anyway? Dumb mutt didn’t know enough to appreciate help. Let him be. John carried his gun in his right hand, his left swinging freely as he turned his steps back toward the dugout. Tip hadn’t come right away, but she would. She didn’t want to leave Duke, but her first love was John. Soon she came trotting up beside him, bumping against his right leg to let him know she was back. Then, startling his heart right up into his throat, John felt the warm wet muzzle of another dog pushing against his left palm. He walked straight ahead, letting the tears flow and releasing the lump in his throat. He and Tip and Duke headed home. I was just reading a blog post over at The Mustard Seed Budget, and it brought to mind a wonderful story from my childhood that taught me that God knows your need before you even know it yourself; and that it is His delight to provide for His children. I was about five years old. We had moved from southern Minnesota to Minneapolis so my dad could attend Northwestern Bible College. It was 1952. Dad had a part-time job in an auto body shop, and Mom worked full time at a bank in the city. It was much harder, I know now, than I realized at the time. I didn’t know that we were poor. It just wasn’t something I worried about. I remember on this particular evening that my mom came home from work very tired. As she went into the kitchen of our apartment, I heard cupboard doors opening and closing, and expected to hear and smell other indications that supper was on the way. The next thing I remember is hearing my mom crying, and my dad going into the kitchen. There were very low voices, and I heard Mom’s continued crying. I remember creeping closer to the kitchen door–in those days, there was often a door between the kitchen and the next room. Yes, she was crying, and Dad was trying to comfort her. I heard her say, “Johnny, there’s nothing to eat, and we don’t have any money to go to the store!” More murmuring, and then I scurried away from the door as I heard their footsteps nearing. Dad called my sister and me into the living room. He said we needed to pray right then, because we needed food and there wasn’t money to buy any. I distinctly remember getting down on my knees beside the big grey sofa with red threads running in a pattern; I remember my mom’s crying as Dad began to pray. As he prayed, I became aware of a noise–quite a lot of noise–in the hallway of our apartment building. The next thing we knew, the doorbell was ringing, someone was knocking, and there were voices that I recognized! Dad got up to open the door, and we all followed him. Standing there with their arms full of bags and boxes were several members of the family from Fairmont, Minnesota, that had “adopted” us into their family while we lived there and attended their church. One of the adult daughters had been burdened early that morning that John and June weren’t doing well and needed some encouragement. She called her parents and siblings, all farm families, and they raided their pantries, root cellars, and freezers; they also brought a variety of other household goods that I don’t even clearly remember. Seems like there were some pots and pans, tablecloths, maybe dishes. I’m not sure. What a party we had that night! They filled our refrigerator and our cupboards. We didn’t have a freezer, so I don’t know if one of the neighbors helped out or how we handled that. I just remember, far more than having a full tummy, that suddenly in the middle of our prayer, a very solemn moment, here came these people who loved us and that we loved so much, providing all we needed and so much more. Sixty years later, I still love this story. God has never failed to provide. Ever.